Overflowing rivers threaten to swamp communities near the South Carolina coast, leaving thousands needing to evacuate. More than a week after Florence crashed into the Carolinas, dumping heavy rains, that water is nearing the coast. Authorities in Georgetown County, South Carolina, said they have put as many as 8,000 people on alert for possible evacuations starting Monday in expectation of a “record event” of up to 10 foot floodwaters this week. 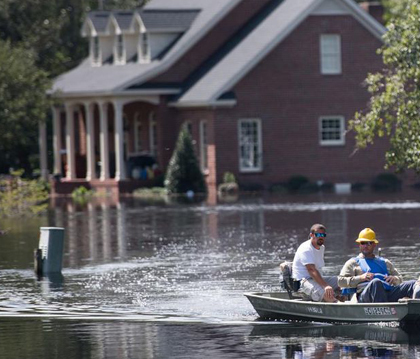 Officials are eyeing gauges along the Pee Dee and Waccamaw Rivers and said people should be ready to leave homes in the potential flood zones before possibly life-threatening flooding occurs as early as Tuesday. Shelters are being opened Monday for area residents and officials are asking people to alert neighbors and friends to the possible dangers ahead. The community was also distributing free sandbags but said Monday was likely to be the last day to rush preparations before they should evacuate. Residents in areas that aren’t expected to flood were also being urged to evacuate since roads may be cut off, according to a statement by Georgetown County spokesperson Jackie Broach cited by CBS Charleston, S.C. affiliate WCSC-TV. In North Carolina, five river gauges were still at “major flood” stage and five others were at moderate flood stage, according to National Weather Service. The Cape Fear River was expected to crest and remain at this flood stage through the early part of the week, and parts of Interstates 40 are expected to remain underwater for another week or more. Parts of Interstate 95 are also expected to be underwater for days, but North Carolina Gov. Roy Cooper announced Sunday night that the major highway (Interstate 40) has been reopened to all traffic, as those floodwaters had withdrawn faster than expected. But floodwaters already receding on one stretch of Interstate 40 left thousands of rotting fish on the pavement for firefighters to clean up. 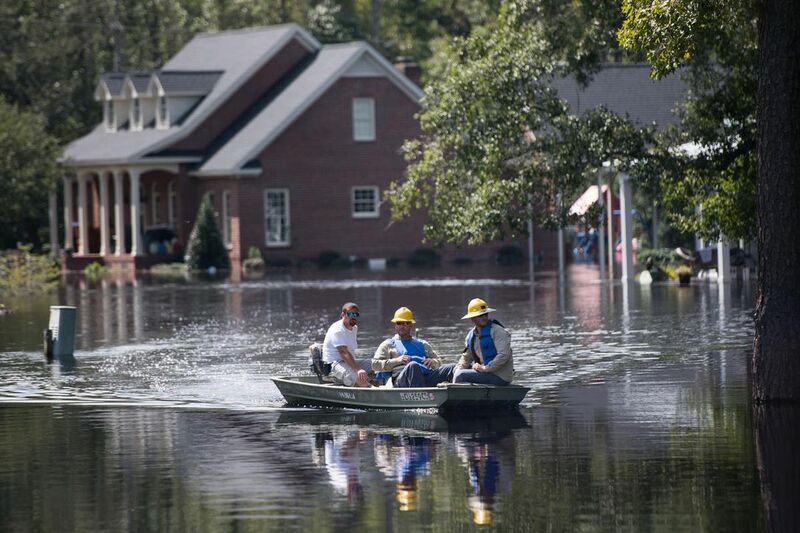 North Carolina Emergency Management Director Michael Sprayberry said eastern counties continue to see major flooding, including areas along the Black, Lumber, Neuse, and Cape Fear rivers. Elsewhere in North Carolina, state environmental officials also said they’re closely monitoring two sites where Florence’s floodwaters have inundated coal ash sites. Crews conducted about 350 rescues over the weekend and travel remains treacherous in the southeastern area of his state. National Guard members will be conducting door-to-door and air search wellness checks on people in still-flooded areas. An economic research firm estimated that Florence has caused around $44 billion in damage and lost output, which would make it one of the top 10 most expensive U.S. hurricanes. The top disaster, Hurricane Katrina in 2005, cost $192.2 billion in today’s dollars, while last year’s Hurricane Harvey cost $133.5 billion. Moody’s Analytics estimates Florence has caused $40 billion in damage and $4 billion in lost economic output, though the company stressed that the estimate is preliminary. Congress is considering nearly $1.7 billion to aid recovery efforts from Florence. Lawmakers are already facing a deadline this week to fund the government before the start of the new budget year starting October 1st and members of Congress are expected to try to act on the disaster relief along with separate legislation to fund the government. • North Carolina woman arrested for sheltering 27 dogs, cats abandoned during Florence. • Less than 340,000 have flood insurance in North and South Carolina combined.